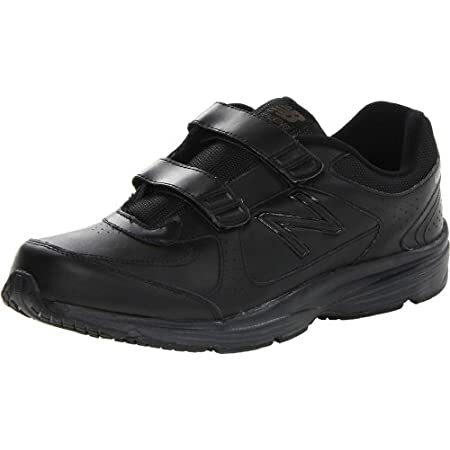 New Balance Men’s Health walking shoes are highly competitive for a number of reasons. They brand has managed to do exceptionally well by providing users with comfort, style, design and variety in a single pair of issues. Due to the prolonged and continued research, the New balance has always managed to offer new and improved shoes for athletes and people who need a regular walk on a daily basis. The research shows that if the foot stays comfortable on a soft and well-balanced base and has an easy transitioning while stepping forward, the fatigue factor acts least and keeps the person walking for long hours. This New Balance Men’s MW411 Hook and loop shoe maintain all the standards as a perfect walking shoe. ​Most of the brands usually fail while trying to produce a shoe providing several features in a single pair of shoe. But, New Balance has truly justified their claim of providing the best walking shoes for men by giving the MW411 pair of shoes. - ​Supportive sole along with the cushioned footbed giving optimum comfort to the feet. - ​Cushioned collar and tongue of the shoes giving support to the ankle and sole while keeping them stress-free as well. To say the least, the New Balance Men’s MW411 Health Walking shoes are very comfortable. They have a supportive inner sole with cushioned footbed. The collar and tongue of the shoes specifically look after the comfort of your toe and ankle or, at least, it makes them completely stress-free. ​The main materials that have been used in this casual walking shoe include the synthetic rubber, synthetic leather and mesh fabric along with an absorbent lining on the inner side of the shoe. All these materials comply with the international standards and provide you the best look in this imported shoe. ​The exterior or the upper side of the shoe is made up of leather in black and gives it a comfy look and an easy walking shoe. In addition to that, the surface is very easy to clean and has hook and loop straps to make sure you adjust and fit the shoe as per your foot bulk. ​The inner side of the shoe is made of soft and comfortable fabric lining that is capable of absorbing sweat and gives an easy wear on feeling for the wearer. Enough padding is there on the collar and the heel area that covers the arches and keep the foot in place. ​As a fact the insole is one of the most important things that matters a lot in keeping the foot easy and comfortable while walking, this new Balance shoe comes with the injection molded EVA midsole gives the foot the best support and keep its pressure-free while walking or running. ​The 13mm heel offset and the inner cushioning of the shoe keep the foot easy while stepping forward and lowers the pressure to make sure that the wearer will not experience fatigue and strain on the foot muscles while walking or running. ​The outsole is made of synthetic materials and has rugged surface and well-adjusted surface to keep the foot stable and avoid slipping off in any condition or while walking on any kind of surface. • The shoe is easy to put on and provides a great facility as a regular walking shoe for athletes. ​• You will not feel overly sweaty and wet during the walk as the inner lining is capable of absorbing the sweat and keeps your foot well aerated and easy. Some customers say that you may need to be careful regarding the selection of the perfect size of the shoe. If you choose the exact size the shoe may not turn out to be easy, rather you may have to choose about half size extra to make sure it will fit in your foot easily. So, consider having a slightly bigger shoe size if you need an easy fit. ​The shoe straps are a bit short and you will have to keep up with them or may get into trouble if your foot is bulky. ​Depending on the experiences and the features, people have given the shoe as best as 4 0ut of 5 stars and which proves that the shoe has satisfied most of its user expectations. ​The shoe has some of the best features that ensure easy and comfortable walking experience. So, whether you need it for a casual walk or you are going to use it on a regular basis, you can trust the shoe as your companion. Concluding our discussion we can say that it’s a good walking shoe for a person having a medium weight body and medium to small width foot.